Vancouver Is An Olympic Wipeout For Russians Expectations were high for Russian athletes in Vancouver, but an underwhelming showing has left Russians at home full of disappointment and shock — and looking to 2014, when Russia will host the Winter Olympics. Find full NPR coverage of the 2010 Winter Olympic Games in Vancouver, Canada. Russia's Alexander Ovechkin (8) and Andrei Markov (79) react after losing the quarterfinal game to Canada 7-3 on Wednesday. Some Russian commentators called the game a "nightmare." For years, the Winter Olympics were the Soviet Union's stage. Between 1956 and 1988, the Soviets won the most medals at seven out of nine Winter Games. Even after the Soviet Union's collapse in 1991, Russians expected success from their athletes, especially in sports such as figure skating and hockey. And that explains the disappointment and shock in Moscow as the Vancouver Games come to a close this weekend. As the events got underway in Vancouver two weeks ago, Russian President Dmitry Medvedev sounded worried. Russians were boasting about the Russian team raking in medals. Some students asked Medvedev how big the pile would be. Not only did the president avoid throwing out a number, he stressed that Russia is in a period of transition, when it has to upgrade sports facilities and train the next generation of athletes. Let's just keep our fingers crossed, he said. But if this was an instance when the president was trying to lower the public's expectations, Medvedev didn't lower them enough. With two days left in Vancouver, Russia has a mere three gold medals, and overall, the country is well behind the first-place Americans. Hope was still alive this week in Russia. But Wednesday night, in a battle of the mighty — Russia's star-studded hockey team against Canada — the match wasn't even close. Canada won 7-3, leading one group of Russian TV commentators to declare that the game has to be "some kind of nightmare." 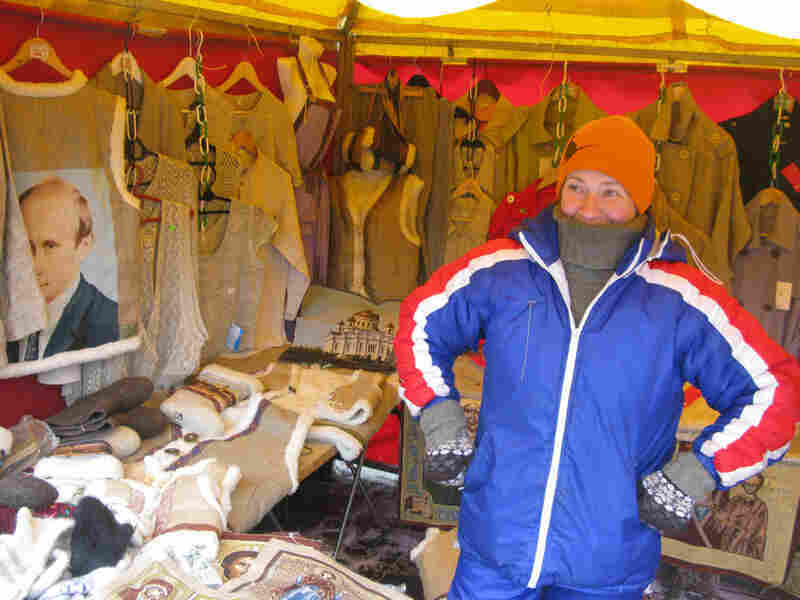 Natalia Dmitriyeva, 48, sells Russian Olympics and other sports paraphernalia at a kiosk near Red Square in Moscow. She watched the Russia-Canada hockey game and tried to ease her disappointment with a bottle of vodka. Russian Natalia Dmitriyeva says she hasn't had a good night's sleep since that game. At a kiosk near the Kremlin, the 48-year-old was selling Russian Olympic team clothing and other sports paraphernalia — which, it turns out, people were still buying. Dmitriyeva, looking weary, could still recount each, painful goal — a sign of just how committed hockey fans are in Russia. That game started at 3:30 a.m. Moscow time, and Dmitriyeva watched the game at home, with a bottle of vodka. She said her husband was asleep. The game was "offensive," she said. "It has really hurt," she said of Russia's performance at Vancouver. Russian athletes, she said, thought they were going to rack up medals. "So now, they're not in a very good situation." But Dmitriyeva isn't giving up. Those years of Soviet glory, she said, were thanks to rigorous training of athletes at a young age. She said her government knows it has to get back to that policy. For cab driver Gennady Nikonov, blasting music from his car helps cure his Olympic woes. "What can I say?" he said of the team's poor showing. "Life is life." Life will be better if Russia can get its act together by 2014, when the country is hosting the Winter Games in the city of Sochi, he said. It would be a perfect time for Russian redemption — yet poses the risk of overconfidence with the Olympics on Russian soil. Nikonov said cockiness was a problem this year. Russian TV commentators said if the U.S. could beat Canada in hockey, surely Russia could, too. After hearing that, Nikonov said he knew Russia would lose. What exactly went wrong for Russia in that big game with Canada? Russia's coach, Vyacheslav Bykov, snapped at a reporter's question. What do you want me to do, he asked, put up a guillotine in Red Square and finish off my players? In Moscow, the feeling is palpable that people are ready for Vancouver to end, so they can start looking forward to 2014.